This sign helped me to realize that I have become a true Alice local. 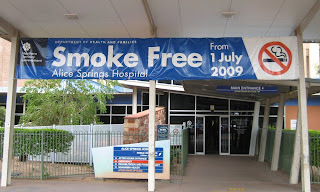 I recently noticed this banner hanging on the front of the Alice Springs Hospital and my first thought was “That’s a nice idea” and not “What do you mean – the hospital still permitted smoking in this day and age!! !” They even removed the ash trays from the front entrance of the building. They cleaned it up real nice and moved the ash trays across the driveway into the parking lot.